Details of a city Most of these photos were taken in the area called Bay Village in Boston. I had never really explored the area. I had some time before meeting a friend for lunch, so I decided to walk over there. I guess, it was uncharted territory for me. It is surprisingly, quiet neighborhood, given it is so close to the theatre district. Ironing Hair, My Living room These are photos of my niece attempting to iron her hair with a household iron. She was trying this in the early morning before school. 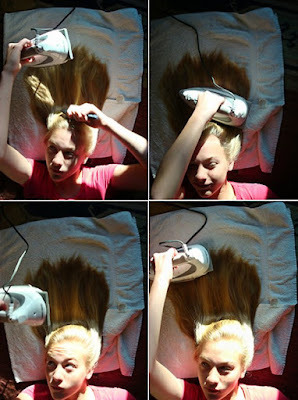 She claims it is better than an using a hair straightener. I think her expressions are great. Fair Ride, Norwood Day This is my favorite mosaic in this group. I love the bright colors. I don't normally take out of focus, action shots. I shot this with my little sony Cyber-shot so it could never be in focus. But, I love the results. The photos capture the energy and vibrancy of this ride. Although, the ride looks a little worried. I love doing these mosaics. Sometimes, photos may not be strong enough or interesting enough on their own. They can also give you an overall feel of a place or event. I especially like the one with your niece ironing her hair. Her expressions are quite amusing. And the color, sunlight and shadows are incredible!